Friends are the only people you can do any crazy thing on this earth with. You would have the best, wildest, and possibly the worst of experiences with your friends. No matter what, friends would still remain the only probable people you may still have the courage to laugh off your worse experiences with and revel in those good old memories. You do not need words to express your feelings for your friends, they just exist between you. So if you do want to show off your friendship, there are these best friends tattoos just for you. Numerous designs are there you can use to show off your friendship to the world. Some tattoos are such that you can mimic on each other. There are matching friend tattoos designs that you can get inked. The theme of the design may be anything, say animals, places, etc. You can have the coordinates of the same place, one that carries significance for you and your friend/s, inked on your body. You could have the tattoos of two cats, or butterflies, diamonds, etc. inked to show off your friends. There are many other matching tattoos designs you can make use of. Many indulge in inking their body with quotes on friendship. You could get half quote on yourself and the remaining half on your friend. There are meaning symbols you could add along with those quotes such as a ship wheel and an anchor with the quote ‘Be the one to guide me – but never hold me down’ respectively. It is often between friends that you make the ‘pinky swear’. Get the word ‘promise’ inked on your pinky finger and make it a permanent promise with such best friend tattoos. There are many such quote tattoos you can get inked on any part of your body, say your side, or back. If you are a group of friends who never leave others side, then getting a larger image inked on to each of you in parts is probably the sexiest idea. You can get a flock of flying birds inked on all of your hands, such that when you link it forms a line in which they are flying. You may have many such best friends tattoos ideas for a group of friends. Puzzle pieces are also a great idea for getting tattooed as friends. There are various puzzle piece designs you can use, such as two puzzle pieces have a lock and a key ingrained into the design. You could also have a broken heart shaped puzzle piece, with each part drawn on your and your friend’s hands. Simple, small, and inconspicuous designs are also used by many friends when it comes to getting tattooed in the name of friendship. 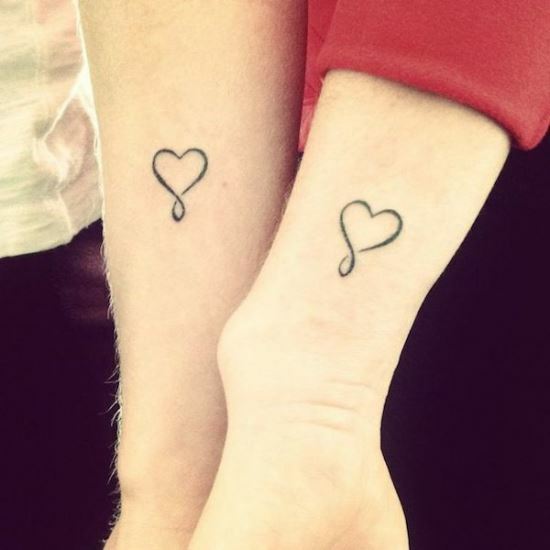 Here, we have collected some of the cutest best friend tattoos for you to sift through, choose, and getting inked on your and your friend’s body.